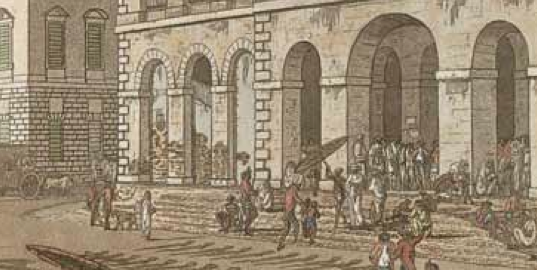 Old Court House and Writers Buildings in Calcutta by Thomas Daniell, 1786. © British Library Board. I came across this incident and a few more like it while doing archival research in India and Britain for my dissertation on legal culture in 18th-century British India. Back in the U.S., I struggled with what to say about it. I knew from secondary reading about the use of such “mixed” juries in early modern England and colonial America, but could find virtually no mention of their role in India. I needed to know more but constraints on time and money meant that I would have to investigate from afar. This article outlines the range and diversity of primary sources I could draw on from my home institution to help understand these mixed juries. Researchers might think that legal records would be among the easiest of historical sources to access and search. After all, lawyers and legal researchers were some of the first to aggressively use electronic databases of sources. However, to research mixed-jury composition, I needed access to resources that the largely present-focused legal databases like LexisNexis couldn’t provide. While surveying all reported U.S. Supreme Court cases back to the founding might not be a problem in the major U.S. subscription legal databases, finding case law from colonial India poses a much bigger challenge. Relatively few published reports of cases from pre-1850 colonial India exist, and not many North American libraries have copies of the print volumes. Fortunately, I found that LLMC-Digital (from the Law Library Microform Consortium) has a strong interest in providing access to historical legal material from areas not traditionally covered by the large commercial providers. Between LLMC-Digital and the microform holdings from LLMC, researchers now have access to hundreds of volumes of reported cases from British India, including a complete reprint set of early Indian reports. Full-text LLMC-Digital searches on variations of the word “jury” in early Indian reports turned up a manageable number of results. At least one case, reported from the manuscript notes of a Calcutta Supreme Court Justice in 1777, yielded significant information. 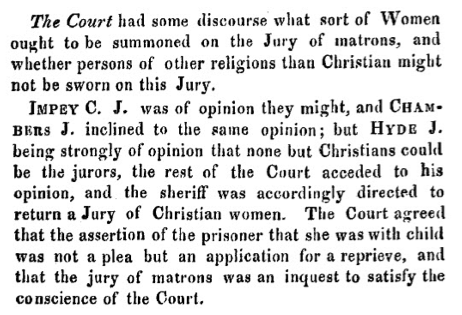 This extraordinary case (Rex v. Peggy) involved a court debate over whether non-Christian women could serve on a jury of matrons (used in deciding whether a convicted woman was pregnant or not). The fact that the court ruled non-Christian women ineligible was even more fascinating, suggesting that the practice of using Hindu and Muslim women on juries of matrons had been an accepted practice earlier. Traditionally the bulk of material in legal databases consists of the published reports of judicial decisions in matters before a particular court. While these published reports often do include copious details about the facts of a case, their overall purpose is to highlight legal arguments, judicial reasoning, and the final judgment in a dispute. For historians and others interested in using legal disputes to understand a particular historical moment, social dynamics, economic trends, or subtle changes in rhetoric, this organization, as well as the underlying logic of reported cases, can prove frustrating and less than illuminating. For instance, the set of reports of early Calcutta trials that yielded the 1777 case also included reports of several dozen other criminal trials but with no mention of the makeup of their juries. A researcher would require access to much rawer detail about cases themselves in order to develop consistent data about jury composition. Fortunately, interest in digitizing historical legal material has moved well beyond canonical works such as published court reports. LLMC-Digital and other providers like Gale’s Eighteenth Century Collections Online (ECCO) and Making of Modern Law offer ancillary legal treatises, printed trial accounts, and other related contemporary documents. In this case, the near-comprehensive nature of ECCO for 18th- century printed material made it quite useful. Searching for mentions of jury proceedings turned up a fascinating narrative extant only at the British Library, which provided details of a 1792 Madras trial. This contemporary description mentioned that the Hindu defendants in the case asked for a mixed jury and were denied one, again suggesting both a change in legal attitudes and the prior presence of a mixed-jury culture. Unfortunately the databases of early print sources yielded few other detailed trial descriptions. Printing arrived in British India only in the 1760s and (with some notable exceptions) few Indian trials received print attention in London during the period. Beyond searching early printed sources, researching most topics in legal history requires consulting manuscript sources. Fortunately, in addition to the original manuscripts themselves, antiquarians, governments, and historical societies produced a glut of local histories and documentary compilations that reprint or incorporate manuscript material. On paper, these volumes have always been useful to historians for their detailed recounting of local events and transcription of important documents. However, finding something like jury composition by skimming or using print indexes in dozens of volumes would be tedious work, if not nearly impossible. The reprinted proceedings of the Madras Mayor’s Court, for example, take up numerous volumes and are obviously not indexed by jury format. With more libraries moving these bulky sets off-site, digital surrogates can be easier to access and search, thanks to mass-digitization projects through the Internet Archive, HathiTrust, and Google Books. Collections like HathiTrust go far toward facilitating access by representing series as a set of consecutive browseable volumes rather than as individual books. Even then, a researcher must produce significant work to curate and organize subsets of relevant material. Nonetheless, searching a set of these digitized printed primary sources in HathiTrust yielded numerous page images containing accounts of early juries and jury proceedings, providing more examples of mixed juries prior to the 1750s. Some of these accounts, including one from an early history of Bombay, included transcripts of records no longer extant in present-day archives. In addition to these published volumes, a significant variety of manuscript material can be consulted in facsimile in the U.S. CRL has one of the best collections of manuscripts in surrogate form, including an impressive set of foreign archival documents in microform. Their holdings of 700-plus volumes of the India Office’s “Miscellaneous Series” of manuscript volumes are indexed in the UK’s Access to Archives platform (which includes the British Library’s India manuscript holdings). A search turned up several transcripts of criminal trials and legal opinions on juries within the microfilmed series. These in turn yielded several examples of mixed juries, including an explicit direction from the Crown Attorney General to impanel such a jury at an early trial in Madras, filling in more details on how these panels may have worked. By the end of this foray-from-afar into the evidence on mixed juries, I was able to make a series of arguments about the changing nature of legal culture in early colonial India: pointing to the decline in incorporating local elites into English legal mechanisms like the trial jury. This brief research story helps stress the importance of academic primary source consortia, including CRL and LLMC, in providing scholars with resources formerly available only in far-flung libraries and archives. I hope it also highlights the crucial role of printed primary source collections in historical research and the need to make these ever more accessible.